Graphcore has shown details of its chip for machine learning, the most complex chip on the planet. The Colossus GC2 Intelligence Processing Unit (IPU) has 23.6 billion transistors in 1216 processing cores with 300Mbytes of fast memory. This runs at 100GFlops and supports 7 threads with a memory bandwidth of 30Tbyte/s and can hold the large models used for machine learning entirely in the chip. For more system performance, each GC2 chip supports 80 IPU-Links to connect to other GC2 chips at speeds of 2.5Tbit/s, as well as a a PCIe Gen 4 x16 link (31.5GByte/s) to connect to host processors. 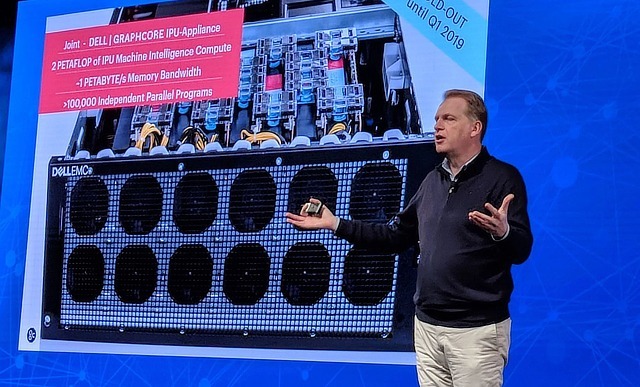 “The way Graphcore has built a new type of processor from the ground up for Machine Intelligence, we find really interesting,” said Michael Dell, chairman and chief executive of Dell EMC. He became a strategic investor in Graphcore through their venture arm, Dell Technologies Capital, back in 2016, and Graphcore has been working closely with teams across the Dell Technologies’ family of businesses since then to access the global scale, channel, OEM, product integration and go-to-market relationships. Graphcore started shipping its C2 IPU-based PCIe cards to early access customers earlier this year, “Dell was one of the first to receive hardware and software and we have been working closely with their technical teams to build out a full IPU-based product range from Dell,” said Nigel Toon, chief executive and co-founder of Graphcore (above). Dell is working with an IPU-based system that contains 8 C2 IPU-Processor PCIe cards, each with two of the GC2 IPU-Processors. This delivers over 2 PFLOPS of machine intelligence computing power, spread across over 100,000 independent parallel programs, working on the machine intelligence model held inside the IPUs, and with memory bandwidth of nearly 1 Pbyte/s, for dramatically higher performance and energy efficiency. The Dell IPU-based platform, combined with Graphcore’s Poplar software stack forms a flexible platform for developing machine intelligence applications. “Demand for product is high and we already have a full order book at Graphcore from our early access customers for our first batch of production silicon and C2 hardware,” said Toon.